Our friends at Rose Charities invite Net2van members to attend their upcoming conference. As you can see, they have some wonderful keynote speakers with lots​ of experience. 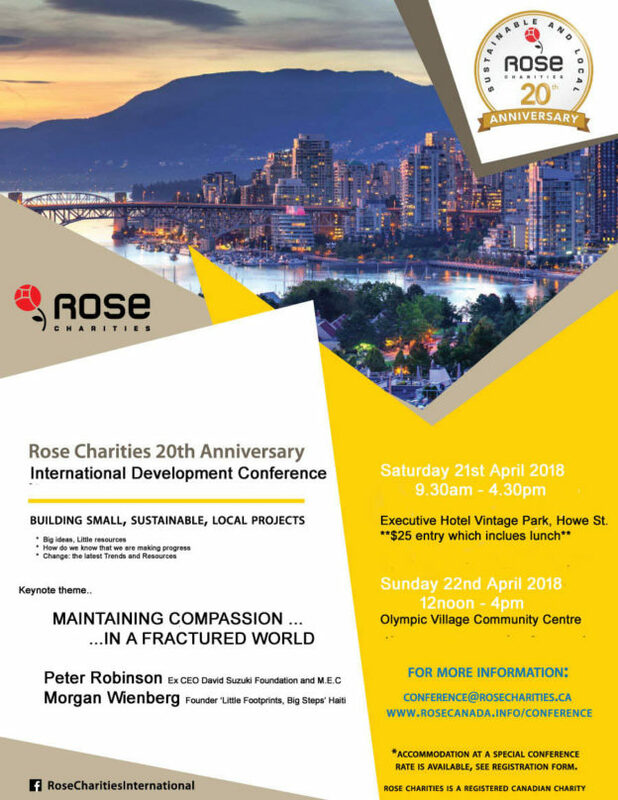 We at Rose Charities Canada would like to invite you (and parters / friends ), to all or any of our Rose Charities Anniversary events (see below) for the weekend of Sat/Sun 21st/22nd April 2018. Some are free, some require registration/payment We are very proud of our track record and would love to share our celebrations with you as well as appreciating any thoughts, ideas or discussion you might like to contribute to the networking sessions. Sunday 22n April 2018 (afternoon) : PROJECT PRESENTATION FORUM: Olympic Village Community Center. Athletes Way, S.E. False Creek. (Parking below) 12.30-4.30pm Finger-food lunch provided. Admission free. Registration at door. HELP AROUND THE WORLD: IDEAS, PROGRAMS AND SUSTAINING THE MOMENTUM : A project presentation forum with discussion. The program will include panels on Health, Safe Motherhood/Birthing, Health, and Community Programs (micro-credit, youth, aged, youth, disability etc) which will involve experienced Rose Charities and partner organizers and founders of effective programs from four continents. Sunday 22nd Evening: ROSE CHARITIES 20TH ANNIVERSARY DINNER. Floata Seafood Restaurant, 180 Keefer Street, Chinatown 6pm -8pm (parking available below restaurant: Food appx $40 (pay when there does not included drinks) in advance or at the door . Relaxed-casual-formal and..
..Will include ‘open stage’ for words, presentations etc. .. please.. and awarding of Charity-Rose Awards for 2016 and 2017. 20 years family dinner of the ‘Rose Family’ . Please let us know if you might like to come to this so we get an approximate idea of numbers. Hope you can join ! .. Best wishes.. Will Grut MD, Rose Charities Canada.